New Robotic Telescope (LT2) design © 2018 Ian Baker. Background: Veil Nebula from LT data © 2017 Wim Van Berlo. Liverpool John Moores University (LJMU) Astrophysics Research Institute (ARI) owns and operates the 2.0 metre fully autonomous Liverpool Telescope on La Palma in the Canary Islands. 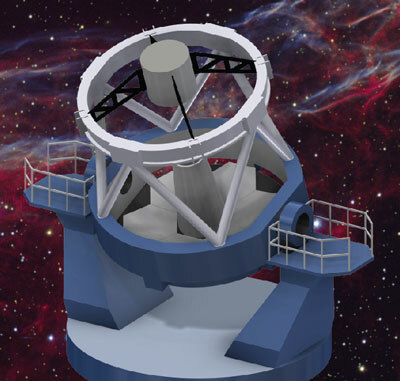 Working with international partners we now intend to build a 4.0 metre version, currently called the New Robotic Telescope, less than a kilometre from the LT on the same mountaintop. All posts are based in Liverpool, UK. The Mechanical Engineer will participate in the conceptual and detailed design of the telescope, enclosure and instrumentation. This will include evaluation of predicted system performance, including flexure and thermal properties under static and dynamic loads. The DevOps Engineer will participate in the development of the software architecture and systems for the telescope and associated instrumentation, as well as build and deployment procedures. Additionally you will manage and maintain IT hardware systems in support of telescope operations. Both of the above posts will work collaboratively with engineers in the same and other disciplines, within LJMU and at external partners and supplier organisations, to ensure individual system and system-wide performance and quality. The Systems Engineer will take responsibility for systems engineering aspects of the new robotic telescope and its associated instrumentation. They will develop and maintain the work package breakdown, error and throughput budgets and interface definitions and act as overall design authority in engineering trade-offs. They will also act as the liaison between Scientific and Engineering domains translating requirements and implications as necessary, and between work package partners in engineering matters. The position is based in Liverpool, UK, although travel to international partners will be required at times.